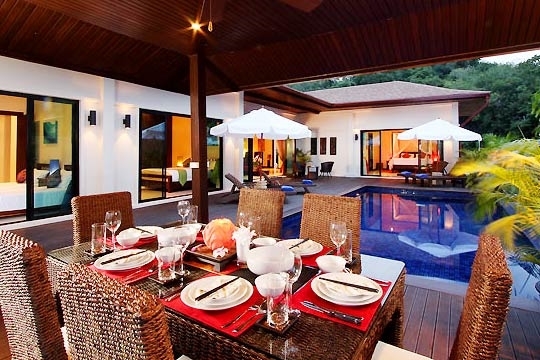 Moonstone Villa, a 5-bedroomed family retreat in a quiet estate just minutes away from Nai Harn beach, offers a full spectrum of holiday delights at a fantastic price. Its friendly staff and a host of inclusive services including an in-villa cook complement the villa’s modern facilities and inviting private pool. 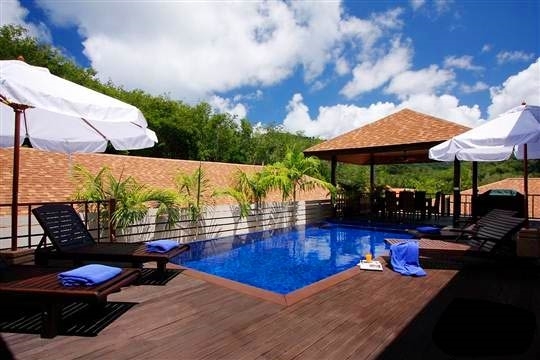 Set in lush, quiet surrounds just a kilometre from sparkling Nai Harn beach on Phuket’s southern tip, this five-bedroom, two-storey villa sits within The Villas private estate. 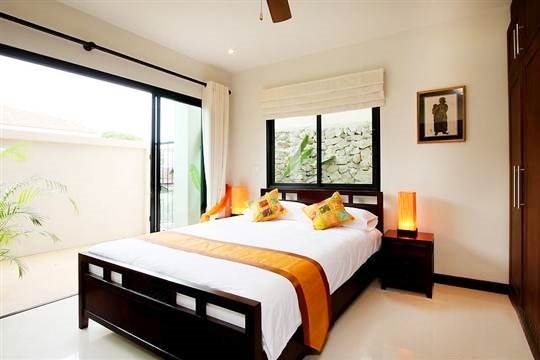 Moonstone Villa is particularly suitable for extended families, offering a choice of a master bedroom, two queen-bedded rooms and a bedroom with twin beds on its main floor, plus a fifth bedroom with a queen-sized bed in a self-contained apartment on the bottom floor. Ideal for those with older children who might crave some independence, this downstairs apartment also features a cosy living room with a TV entertainment unit and a kitchenette, while outside under cover is a table-tennis recreation area. Moonstone’s living areas all have an easy, comfortable elegance about them that families will settle into effortlessly. The spacious, open-plan central room on the villa’s top floor houses the main living room, a dining area and a modern kitchen. Guests of all ages will relish the eight-metre pool with jacuzzi and expansive terrace space for lounging in the sun. Nai Harn, one of Phuket’s prettiest white-sand beaches, is only one kilometre away. Along the way is a public park with a children’s playground and lagoon. There are plenty of dining options at the beach and in Nai Harn village, from simple noodle shops to upscale Italian, French and other international restaurants. Those wishing to explore will love cruising these coastal roads on Phuket’s southernmost tip, which lead to some of the island’s most picturesque lookout points and lesser-known beaches. 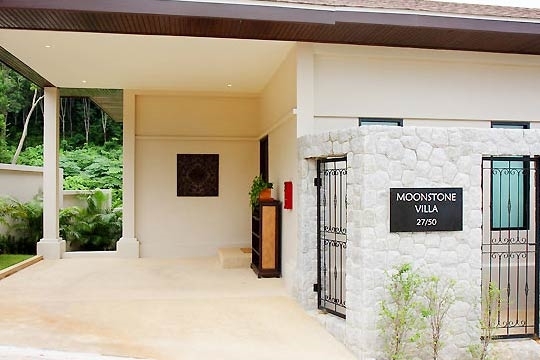 On arrival at Moonstone Villa, guests are met by the villa manager who checks in regularly throughout the stay. She can help organise extra services such as car rental, babysitting, massages, taxi service and tours. Complimentary services include in-villa laundry and airport transfer as well as breakfast and lunch prepared daily by the full-time cook—housekeeper (guests pay only for provisions at cost). Alternatively, evening meals may be arranged in place of lunch for a small extra charge. At the centre of a lush oasis but with all the modern comforts of a luxury holiday home. Moonstone’s quiet location and easy access to the beach are its main attractions. Having up to two meals a day prepared for you is a big bonus, too! 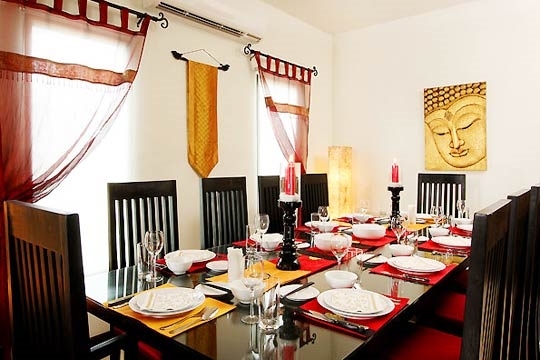 Overall, staying here is just a very relaxing and worry-free experience. Because it’s set in a separate apartment, guests in the downstairs bedroom may find themselves locked out of the main part of the villa at night (or they will have to use a key to access it, potentially disturbing other guests). Thus, no impromptu midnight raids on the kitchen! Teenagers or a second couple will certainly love the added privacy, however. I would not recommend anyone to stay in this villa. The villa is quite average for the price one pays! The staff gives you attitude and the service is much to be desired! The pool area is not kept up well. Overall one of the worst villas one has stayed in Phuket!!!! 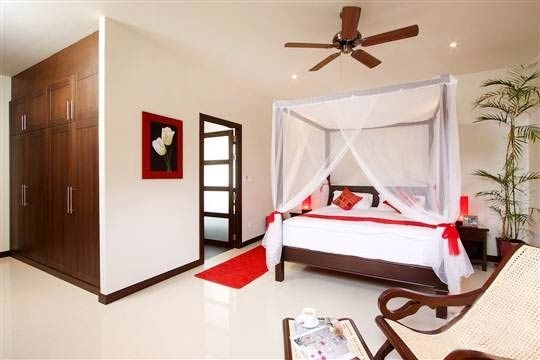 Moonstone Villa is one of ten holiday homes in The Villas estate in Nai Harn, which also includes Sunstone Villa, Gemstone Villa and Emerald Villa. Though the properties are close together, high walls offer privacy and it is overall a very quiet location. A 15-minute walk (1km) along the peaceful, leafy Soi Naya road, past a lagoon and park takes you to the inviting sands of Nai Harn beach. Soi Naya is truly the ‘villa centre’ of Phuket’s south, but property development along here has so far remained fairly high end and well spaced out. There are no shops or restaurants to be found until you reach the beach area or, if you go a bit further in the other direction, Sai Yuan Road (1.5km), which is chock-a-block with restaurants, grocery and convenience stores, small shops ranging from tattoo parlours to hardware outlets, and simple noodle and rice stands for enjoying a tasty, cheap meal. Nai Harn is a scenic bay on the southern tip of Phuket. Its generous stretch of pure white sands and glittering turquoise waters have adorned many a postcard, yet for some reason it remains off the radar for most tourists who flock to the more popular southern beaches of Kata, Karon or Patong. Nai Harn lacks the sophistication of the more northerly beaches of Surin or Bang Tao but its casual charm and relaxed tropical vibe offer an appealing alternative. Revealing something about Nai Harn’s character, one of the longest-running night spots in the area is the Reggae Bar, which hasn’t changed its Rasta-cool look in years. A Buddhist temple which occupies most of the land approaching the beach certainly adds to Nai Harn’s calm nature. Surfing, snorkelling or simply lazing the day away on a rented sun lounger are the main daytime activities here, while in the evenings there’s a wide choice of restaurants to sample in the village, from noodle stands to upscale French and Italian eateries. The row of rustic restaurants in the shade of casuarina trees just back from the sands offer an excellent spot to watch the spectacular sunsets while indulging in a fresh seafood meal. The south-west monsoon from May to October kicks up some pretty hefty waves and there can be a strong undertow, so be sure to heed the red-flag warnings. Phuket is internationally recognised as one of Asia's premier tropical island destinations. The island welcomes four million plus visitors per year to an exceptional international lifestyle, stunning beaches with tranquil waters, vibrant towns and spectacular scenery – all with an exquisite tropical climate and world-class cuisine. Located approximately one hour’s flying time from Bangkok and only a short flight from Singapore, Taiwan and Hong Kong, the island is serviced by an international airport with direct flights to and from many major cities in Asia, Europe and Australia. The island offers an impressive portfolio of leisure and lifestyle amenities including world-class golf courses, wonderful seascapes for sailing, diving and snorkelling as well as luxurious spas, international cuisine, high-end shopping complexes, chic boutiques, vibrant bars and lively nightclubs. The infrastructure includes excellent international hospitals and health services. Moonstone’s five bedrooms, two living areas and kitchen are spread across two levels, with the downstairs being a separate, self-contained one-bedroom suite. With its spacious pool terrace and connected open-plan living area forming the heart of the villa, Moonstone is well designed for families or groups seeking to party or relax in total comfort. The terrace’s eight-metre infinity swimming pool, barbecue and sala (gazebo) with a dining table offer an extensive area for relishing the tropical climate, with three bedrooms and the living room enjoying direct access to the terrace via sliding glass doors. The master suite opens onto the pool terrace and is tastefully furnished with a four-poster king-sized bed, a rattan easy chair and a large wooden wardrobe. 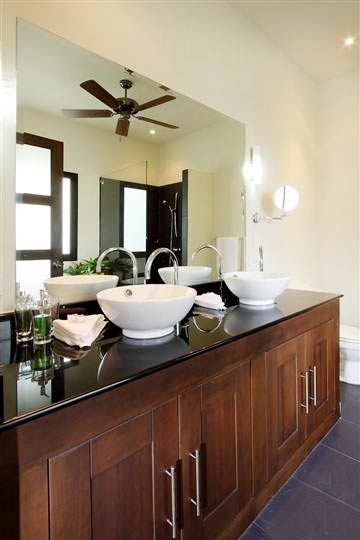 Its ensuite bathroom has a bathtub, shower and two vanity sets. Down a corridor off the living area is a queen-bedded room and a bedroom with twin beds, both of which open out to the pool terrace. Between them is a shared bathroom with a shower. Another queen-bedded room sits across the hall at the back of the villa, featuring its own private bathroom to make up for the lack of a view or pool access. The main living room has a large and comfy wine-toned sofa – perfect to pile onto for a night of movie-watching on the 42-inch flat-screen TV. From here, double-wide sliding glass doors lead out to the terrace. 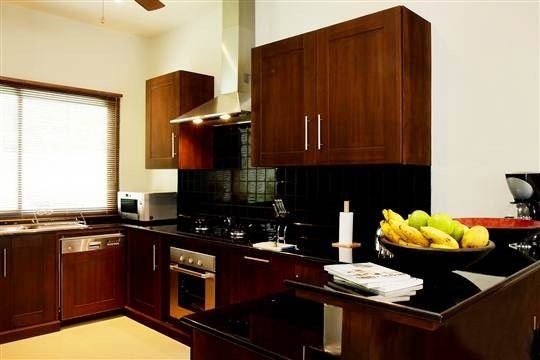 Opening onto the living room is a Western-style kitchen, fully equipped with modern appliances and with a breakfast bar that makes just the place to savour a coffee or watch the villa cook in action! 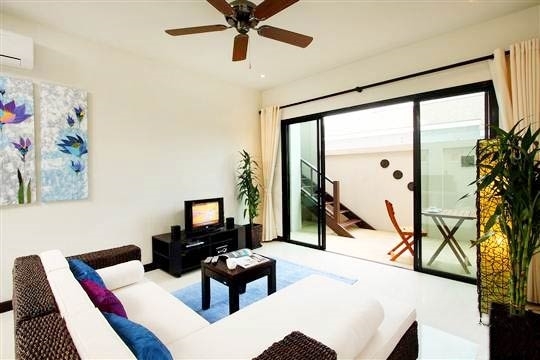 The second comfortably furnished living room is downstairs, also equipped with a TV plus a kitchenette. This smaller living room sits between the open table-tennis recreation area and the villa’s fifth bedroom, which has a connected bathroom and a queen-sized bed. 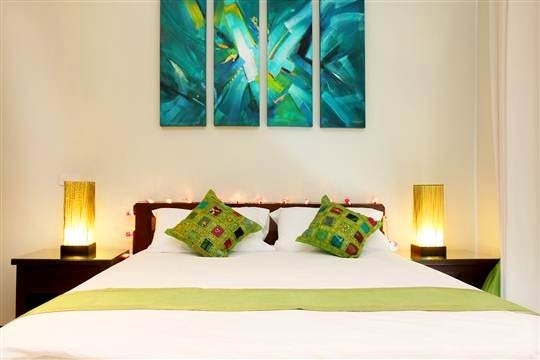 Each room features its own vivid colour theme, with a charming mix of framed photographs, modern art pieces, Thai silks and decorative accents, and all are fitted with air conditioning and ceiling fans. 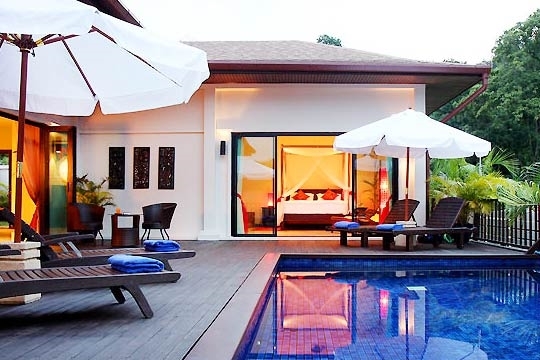 Upon arrival at the villa you are required to pay a security deposit of THB 20,000 (the villa reserves the right to amend this without prior notice). The security deposit will be returned to you prior to departure less any extra charges or costs for accidental damage to the property. The villa prefers payment by cash. Found via a narrow road along the front of The Nai Harn resort (formerly the Royal Phuket Yacht Club) on Nai Harn, this tiny beach offers a pretty place to snorkel and sunbathe on the sands away from the crowds. There’s a small open-air restaurant here serving a selection of Thai and western dishes. Though it seems to get busier with each passing year Phuket’s southernmost beach still has a laid-back vibe. Surfing, snorkelling or simply lazing the day away on the sand are the main daytime activities here while the evenings bring joggers and sunset watchers. This cheerful cafe with white picket fence is a fine spot for afternoon tea. Relax and indulge in a homemade slice of cake in the cosy air-conditioned interior or out on the shaded veranda. Have a big breakfast feast or evening tapas session in Crepes’ pleasant garden setting with sweet and savoury crepe selections, cocktails, wines and fresh fruit shakes. Crepes runs a good-value Thai cooking class, too, where you’ll learn to make four dishes and visit a local fresh market to shop for ingredients. With Italian favourites from a menu prepared by a Tuscan chef, Davinci serves up both style and flavour in its alfresco dining and lounging areas. There’s a play room for the kids, while sports lovers can catch all the latest F1 and football action on the big-screen TV. Good range of wine and cocktails. Creative cocktails, cold beer, and a splendid tropical setting make this an ideal spot for an afternoon swim and chill-out session. Found on the seafront at Serenity Resort, families are welcome to use the big pool while they savour their Thai or Mediterranean meals. Evenings feature DJ music and theme nights. This American-run resort and open-air restaurant is a casual weekend hot spot for local expats, with a big, well-priced menu featuring everything from vegan fare to giant beef burgers. Diners are welcome to use the pool for no extra charge. Live music on Friday and Sunday evenings. Along the Nai Harn beachfront there are a handful of open-air restaurants set just back from the casuarina trees serving up seafood, Western fare and Thai favourites at reasonable prices. Nothing fancy, but the sunset views are superb and the beer is ice-cold. Set on the waterfront in Rawai, Nikita's is one of the island's favourite watering holes. Enjoy a cold beer and great sea views from the garden café-bar, and feel the cool sea breezes as you wine and dine after dark. A great spot to while away a lazy afternoon. Favourites from its big menu include massaman chicken and pizza prepared in the wood-fired oven. This healing and detox centre at Friendship Beach Resort features a variety of different spa treatments ranging from relaxing massage, foot reflexology, herbal therapies, aroma therapy, facials, manicures, body scrubs and body wraps. Atmanjai also offers full intensive detox, cleansing and healing programs and daily beachfront yoga sessions. This well-regarded retreat and healing centre focuses on fasting and cleansing programmes. It also provides a full range of spa services and workshops for reiki, meditation, tai chi and more. The busy Tesco-Lotus supermarket sells fresh produce, seafood, dairy, deli items, canned goods and a small selection of baked goods, plus some wines, beer and spirits. A better range of wine and fresh baked goods are available at the small Wine Connection outlet. A bookshop, several banks, a massage parlour, pizza and ice-cream outlets and a Black Canyon cafe are also found here. This is Phuket’s most revered Buddhist temple featuring an elaborate chedi that contains a splinter of the Buddha’s bone brought from Sri Lanka in 1999. Listen out for firecrackers set off by devotees to pay thanks for their prayers being answered. Spectacular sunset views from this lofty headland on Phuket's southern tip. Bustling with souvenir and batik shops and the occasional local artists' festival. Kitesurfing lessons and rental from its main base on Chalong bay or in Nai Yang Beach. Also offers stand-up paddle lessons and rental. A Muay Thai kickboxing training centre, this gym offers fight training in this ancient martial art of Thailand plus fitness training, yoga and taekwondo. All levels, from complete beginners to professional athletes, are welcome to come try it out. 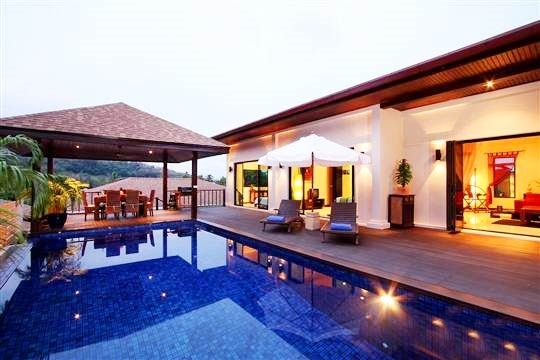 5 bedroom villa located in Nai Harn, Phuket. Ideal for Beach in ten, Body and soul, Bring the relatives, Kid friendly, Fair share for groups, Party pads. 7 out of 10 based on 2 user reviews.